I made my first sugar cookie Christmas tree. So easy and beautiful! The holidays are not my most productive time of the year, bake-wise. Maybe because it’s summer here (Buenos Aires) and the hot weather really takes the fun out of turning the oven on. Or the fact that everybody wants to get together before the end of the year, so I sprint from here to there all month. But a short trip to the US last month brought back cookie cutters. A lot of them, taking into consideration what I said above. Then I had to decide what type of cookie to use. While sugar cookies are a classic, I debated making my beloved gingerbread cookies with white glaze. They are perfect for hanging in the tree and taste so amazing. But traditional won, and a white Christmas it was. A hot one. 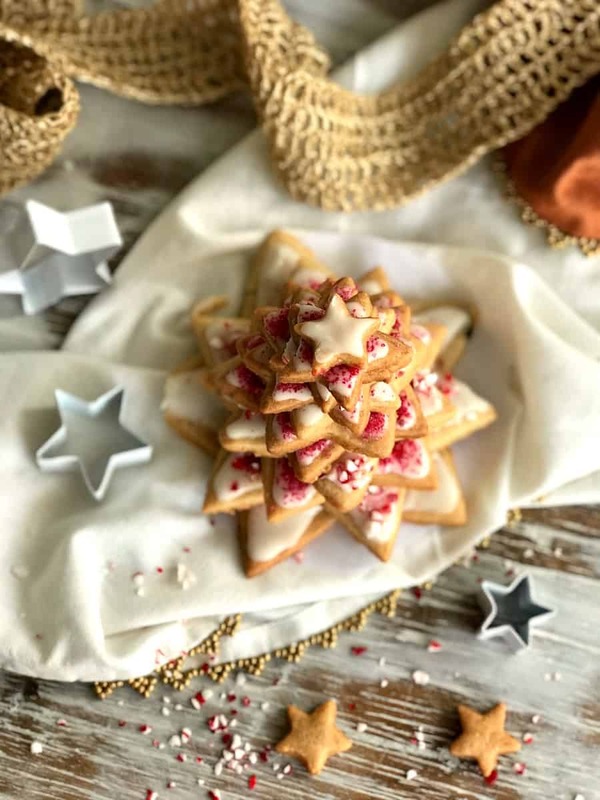 December 8 (the day we decorate our tree here if you’re into that) found me ready to tackle the sugar cookie Christmas tree, which are a bunch of star cookies, all different sizes, that are piled making sure the pointed parts are mismatched. That way you get the idea of a pine tree. Cute, very cute. The recipe for the sugar cookies hails from Sally’s Baking Addiction and it never fails. It comes together easily, rolls and cuts without a glitch. Just make sure the dough is really cold so the cutouts keep their shape. I put them in the freezer for a few minutes and problem solved. I glazed them with a simple confectioners’ sugar and lemon juice glaze and added some red sugar crystals and crushed peppermint candy. A lack of piping bag skills calls for some crushed stuff, the redder the better. 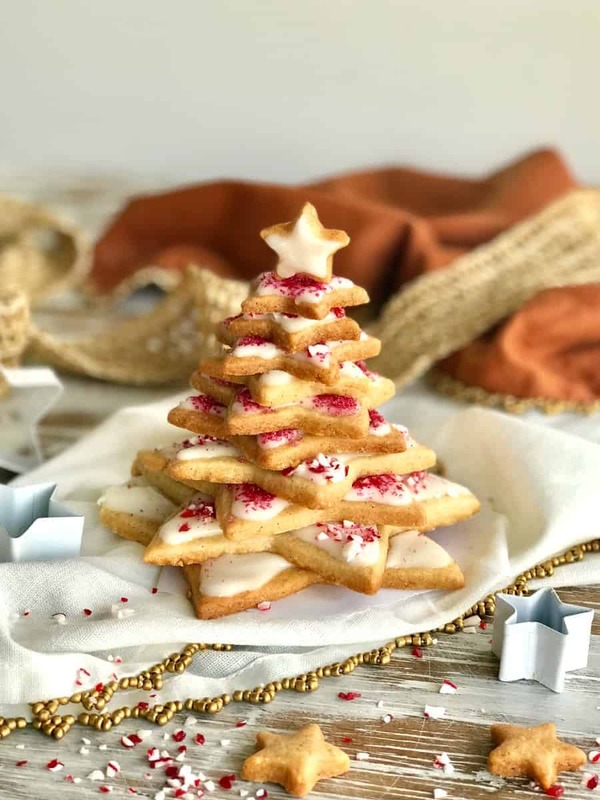 Turns out, a sugar cookie Christmas tree has no need for fancy decoration really. You can get away with some sprinkling. Or even with a top star that has a smudged glaze. I wonder whose fault was that, huh?. I hope they will be the centerpieces on my holiday table. I say hope because I always make a list of homemade gifts and decorated cookies for the table and such, but they rarely come to life. Sad, I know. But so true. Happy holidays everyone! Hope your days are filled with love, cookies, and harmony. Beat butter with sugar until smooth and creamy, about 1 minute. Add vanilla and almond extract and mix well. Sift dry ingredients: flour, baking powder and salt (I measure them and sift directly over the butter mixture). Add them in 2-3 times to the butter, mixing at low speed and only until combined and no dry spots remain. Divide the dough into two or three parts. Chill for half an hour. 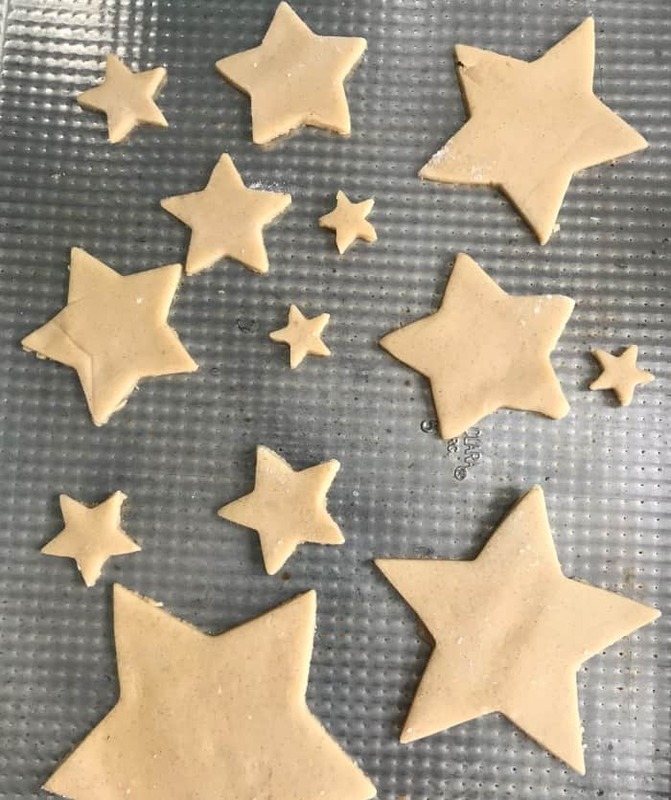 Place each portion of dough between sheets of parchment paper, roll about 1/4 inch thickness (add some flour if needed to prevent the rolling pin from sticking) and place on cookie sheets. Refrigerate them for another 15-20 minutes, or freeze for five minutes, or until they are very cold but not starting to crack. 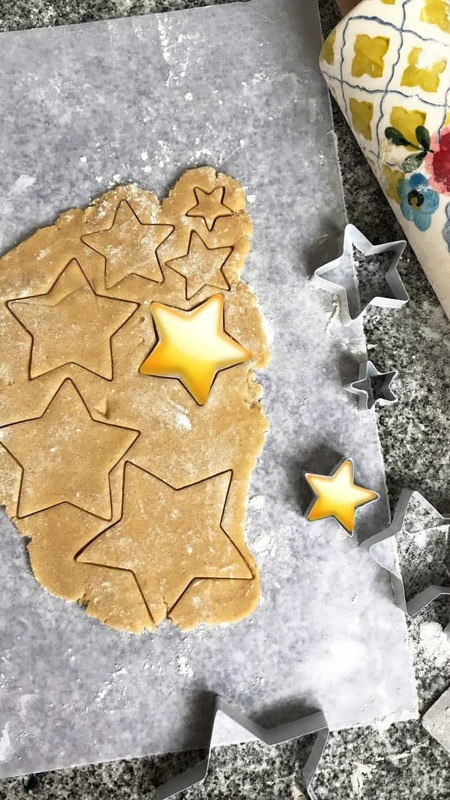 With cookie cutters cut dough into the shapes you want. Place the cut cookies on baking sheets and bake for about 10 minutes, until dry and just starting to color. If you want chewy centers underbake them for a minute or two. Careful as different sized cookies will have different baking times. Mix confectioners’ sugar with a teaspoon lemon juice. Add drops until you have a thick and smooth consistency, similar to thick honey. 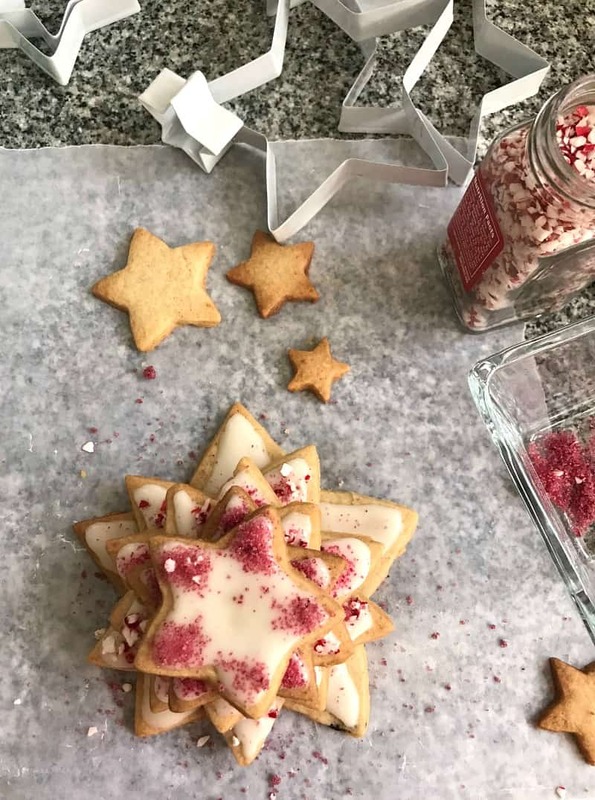 Take the largest star cookie and glaze the top. Place on the serving plate and sprinkle the ends with colored sugar and crushed peppermint candy. 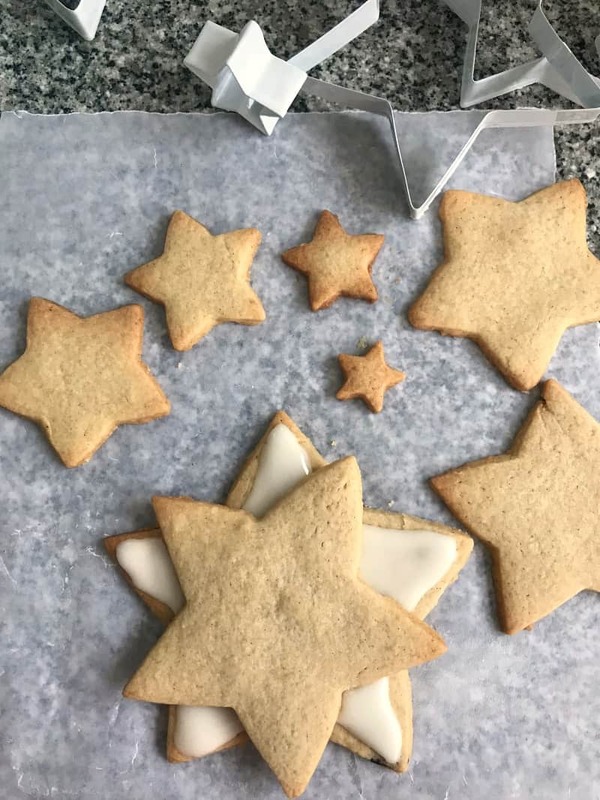 Continue glazing and piling the other star cookies, from the largest to the smallest. Be sure to alternate pointed ends so you create a tree. Let the glaze set before you move the tree. Repeat if you made cookies for more than one tree. 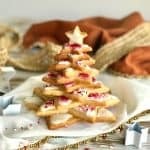 Such a lovely cookie tree!